Select the filters to find your athlete and click Search. Click the + sign to the left of the student’s name. Click the red [Move] link. Select Move To a Different Class radio button. Select your options and pick the desired class. If they are wait listed, a check box will appear below the Location/Time Slot field, Check this box, if you want the student to stay in Waitlist in the new class. If you check it, the bottom button will say Process Move - No Payment needed, even if you add additional fees. After you complete the move you will need to click Manage next to the Student to Pay & Approve their registration at some point. If you leave it unchecked, you will have buttons to pay instead which will remove them from the wait list. This will NOT automatically charge more if there is a price difference from the original class. This allows you the flexibility to optionally charge any difference you want. When you pick the Location/Time Slot you will see what they Originally Paid in that column (if they are wait listed, the column will say "Original Fee (Not Charged)"). If you wish, fill in the desired Additional Charge field(s). 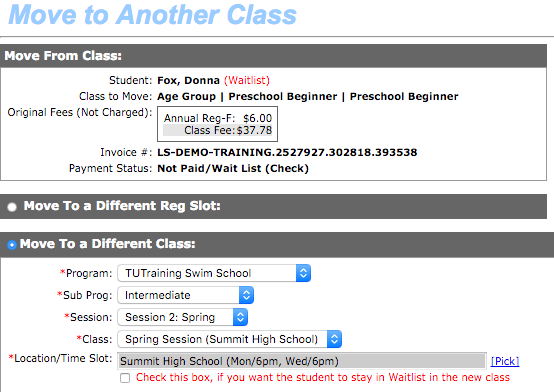 Click Process Move - No Payment needed if you did not add additional fees, or you did but kept the student wait listed, and they will be moved to the selected class. If you added an additional charge, or did not but removed the student from the wait list (step 8a above), you will see either a Pay NOW button, or Pay By Check and Pay By Credit Card. Click Pay & Submit the Registration, then OK to confirm. If you click either Pay NOW or Pay By Credit Card, if they paid with a CC at registration and it's still a valid card, enter the CVV code and skip to the last step below. Either click Use this card next to an existing CC, or click Add New Card, fill in the CC details (the Copy From Account Info button speeds the process), and click Save. Click Pay & Submit the Registration, then OK to confirm and the additional fees will be charged appropriately to the new or existing CC and all other information will be updated.